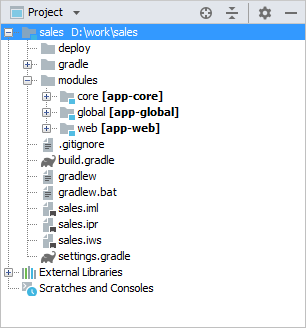 Below is the project file structure of a simple application, Sales, consisting of the Middleware and Web Client blocks. The project root contains build scripts: build.gradle and settings.gradle. The modules directory includes the subdirectories of the project default modules − global, core, web. 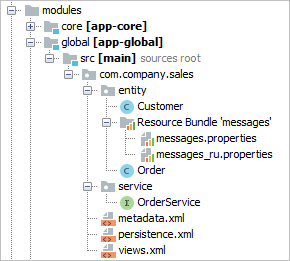 The global module contains the source code directory, src, with configuration files – metadata.xml, persistence.xml and views.xml. The com.sample.sales.service package contains interfaces of the Middleware services; the com.sample.sales.entity package contains entity classes and localization files for them. db – directory with the database create and update scripts. src – source code directory; its root contains the application properties file of the Middleware block and the spring.xml configuration file. 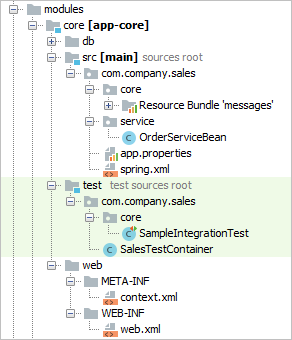 The com.samples.sales.core package contains the Middleware classes: implementations of services, managed beans and JMX beans. test - middleware integration test sources root. web – directory with the configuration files of the web application built from the Middleware block: context.xml and web.xml. 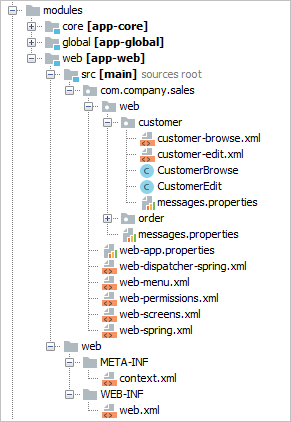 src – source code directory with the application properties file of the Web Client block and configuration files – web-menu.xml, web-permissions.xml, web-screens.xml and web-spring.xml. The com.samples.sales.web package contains the main class of the Web Client block (inheritor of DefaultApp) and the main localized messages pack. web – directory with configuration files of the web application built from the Web Client: context.xml and web.xml.